Flooring : Marble or Vitrified Flooring in entire Apartment. Doors : Front-Decorative teak wood door, Internal-enameled flush doors. Windows : Powder coated Aluminium windows with M.S. Grills. Kitchen : Granite platform with stainless steel sink and up to 5′ Colored tiles all around the wall. Elevators : Elevator of eight-passenger capacity. Bath Room : Colored Glazed tiles up to full height and anti-skid flooring. Electrification : Concealed copper wire with modular switches. Painting : Putty finish enamel paint for all the internal walls. Plumbing : Good quality C.P. fittings for toilets & Kitchen. Water : Round the clock water supply through well and Municipal sources. Security : Day and Night Security. Special Features : Fire Fighting systems in all the floors. Provision for fixing Aqua guard, inter locked pavement, LPG reticulated system to all apartments. This entry was posted in Property and tagged 3 bed room. 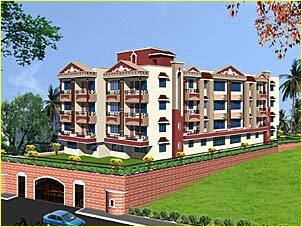 4 bed room, apartments, bejai, flats, Mangalore, new apartments, pinto labe, sai radha, Sai Radha Jagannath. Bookmark the permalink.